Christmas is coming! 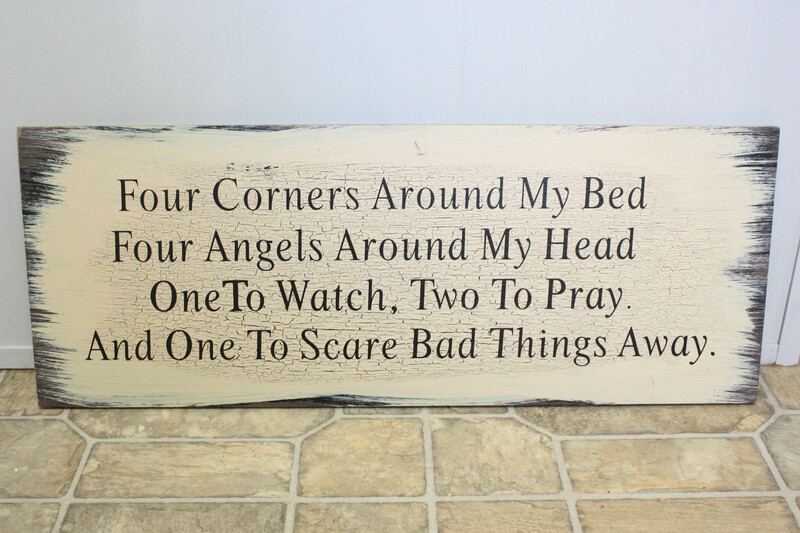 I LOVE to decorate….like seriously love it. I always have, even since my college apartment days. My little bedroom had a tree and was all decorated up from the Dollar Tree 🙂 I love how cozy the holidays make your home feel, and I absolutely love to do a little Christmas DIY’ing here and there to add that special touch to my decor. This year, my Christmas decorating is a little different than before. If you are just following along for the first time, you may not realize, but my husband and I have bought a single wide mobile home, and we are in the process of fixing it up out on our 20 acre farm. We will be living here until we build our dream home, hopefully sooner than later! To get fully caught up, you can check out this post here. SO…with much less space and a little bit of a different “theme” going on in this home, I decided to go fairly neutral with my decorating this year. I gave a little bit of color, but mostly whites and silvers, since I have so much color with my furniture, cabinets, etc… Even though I love to decorate, this year the money was extra tight in terms of buying lots of new items. Every dollar we spend needs to go towards the future home and updates on our land, shop, pond, etc… NOT towards my obsession with Christmas decor! 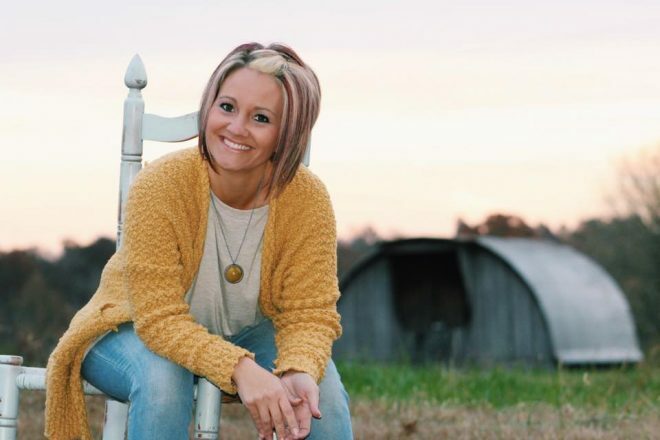 But, that didn’t stop me from wanting some new things…so I decided to make some changes to some things, including the one I am sharing with you today! I got this sign from a family member when my 5 year old daughter was born. It is so sweet, but it never matched any of decor, and it never got used. For years it has been stuck in a closet. I was about to sell it in our church yard sale (in fact, I had it out and tried to sell it), when I got the idea to make a Christmas sign. 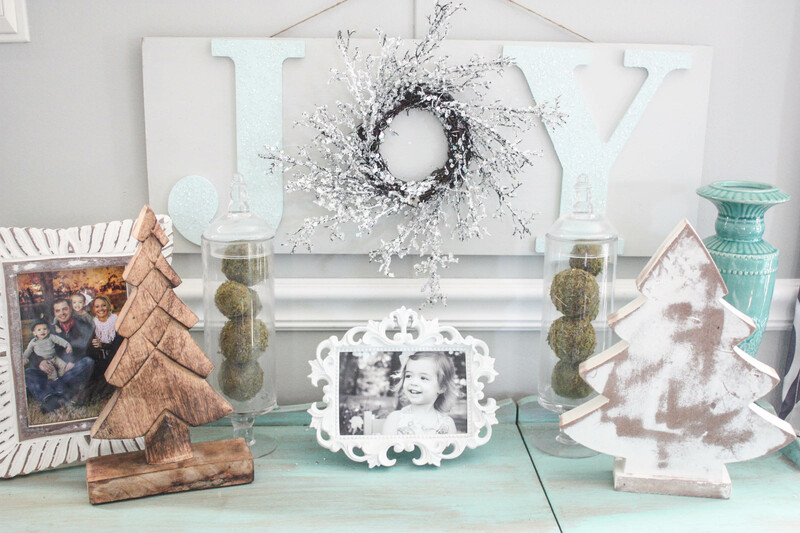 I LOVE pieces that say JOY (like my JOY pallet sign), and I wanted one that would go with this semi-neutral theme. Nothing wrong with this sign, but I didn’t need it. It didn’t match, and it wasn’t necessarily my taste. It was a great size, and it was ready to hang! All it needed was a makeover! I decided to paint the sign, using regular wall paint that I had on hand from our recent remodel. We used the same gray color in the kitchen, living, hall, master bedroom and kids room! It is Madeline Steps by Valspar. It’s a very light gray. You can use any kind of paint for this project. There is no right or wrong. 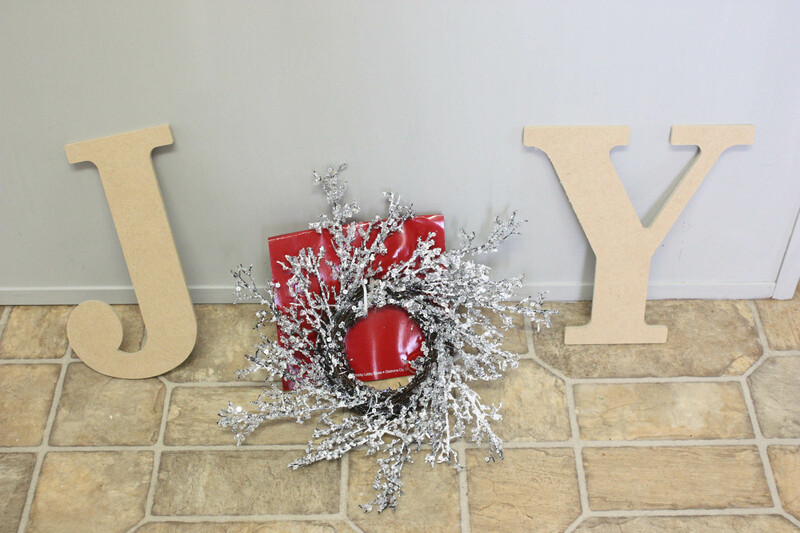 Since I wanted the sign to say JOY, I bought a J and a Y from Hobby Lobby (you can get at any craft store), with the intention of painting them- and I got a cheap little silver sparkly wreath to use as my O. I also got this at Hobby Lobby for around $2.00. I had some paint leftover from my recent little girl’s chest makeover, so if you saw that post, you will recognize this color! 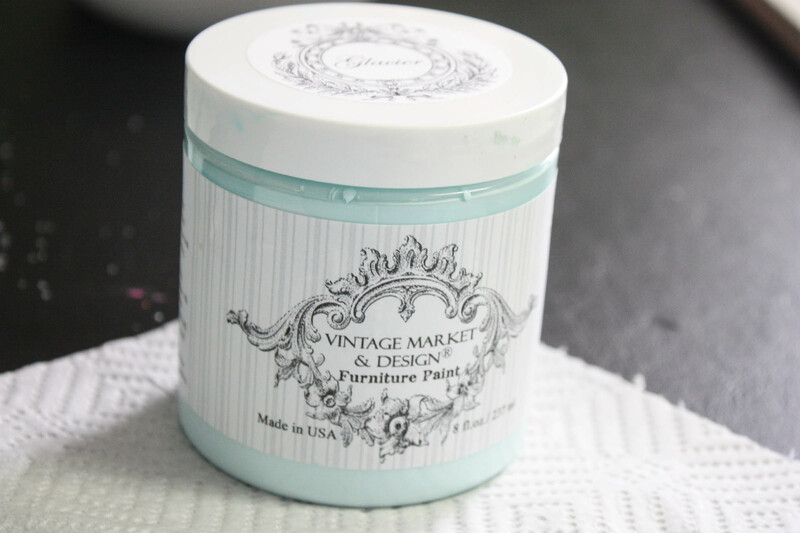 It is Glacier chalk paint by Vintage Market & Design. I really love this color! I used the same color on my Pallet Coat Rack a year ago! 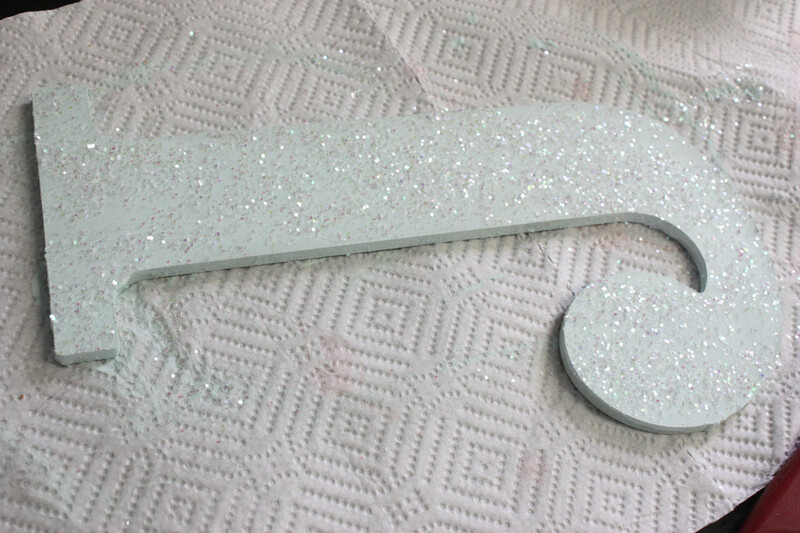 I simply painted it on the letters with a cheap little paint brush, and while the letters were still wet, I sprinkled iridescent glitter on the paint to give a sparkly finish! I love how it turned out! When the paint had dried, I simply hot glued the letters and the wreath on my sign, and I was good to go! Such an easy little project! It looks like a store bought sign hanging in my living room, and I am very proud of it! To hang it, I simply took some twine I had on hand and tied it around the saw tooth hangers that were already on the back. I liked the way this looked more than just nailing the sign to the wall. What do you think? 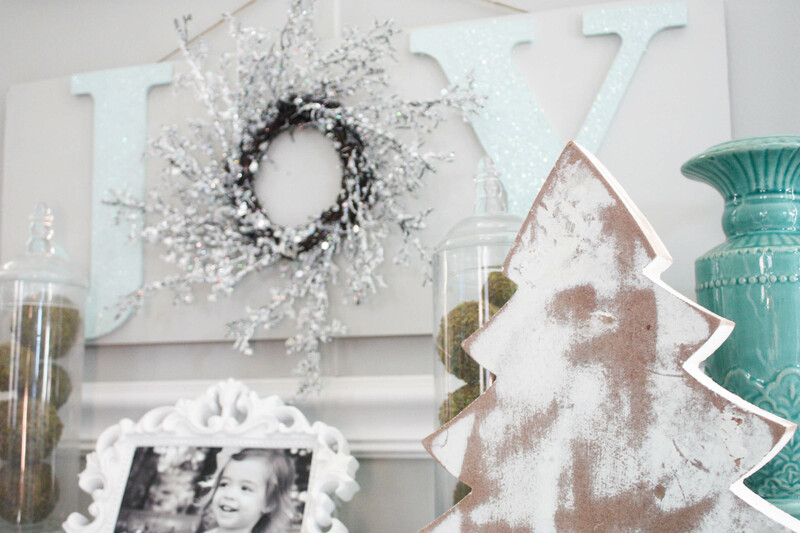 I think the glitter and the sparkly wreath take this project to the next level. I didn’t invent some super amazing project that nobody has done, I am sure- BUT…it is cute, simple and cheap- yet adds a great little piece of Christmas to my little living room, and I couldn’t be happier! 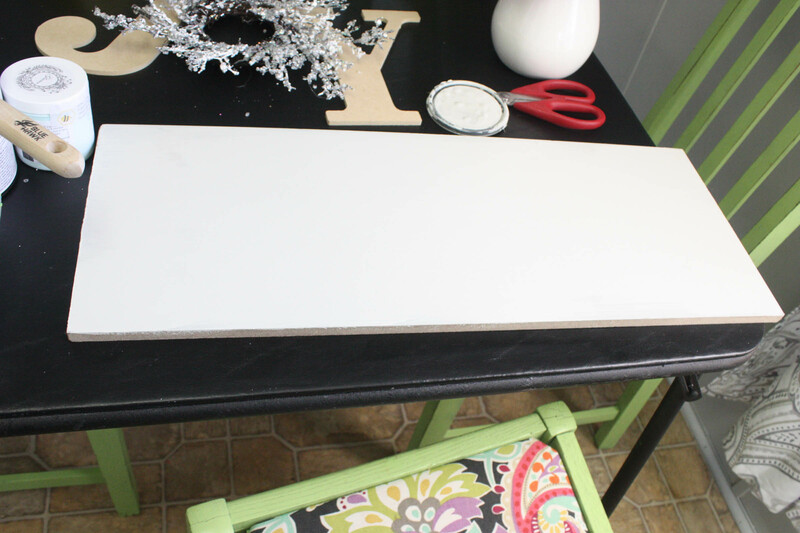 Hi Brooke ~ Wow , this sign looks so easy to make & so so elegant! I am an Aqua girl too & just drawn to anything you paint in the azure color! 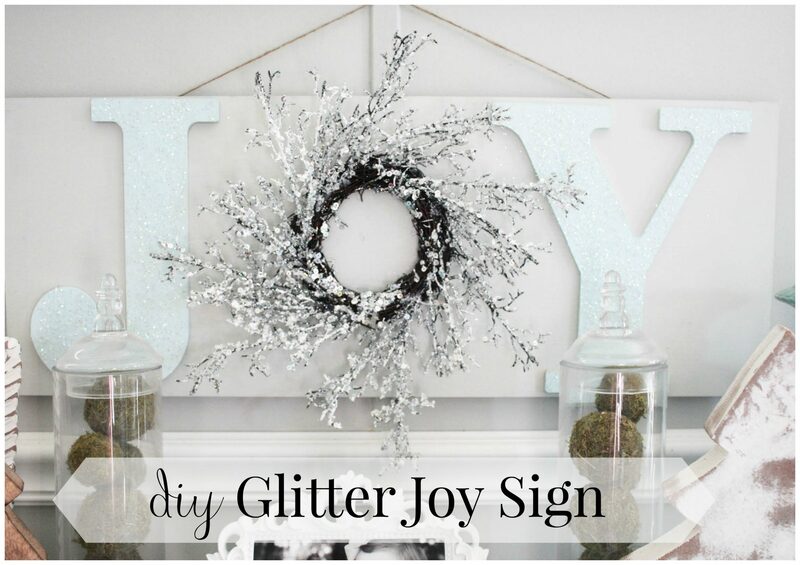 The addition of the glitter & the darling silver wreath just make this cute sign so upscale! I would love to make it for my best friend, she would b impressed if she thought I was this crafty! ~ You are remarkable! Aw thank you SO very much! This made my day! I sure appreciate you taking the time to comment. This may be my favorite thing you’ve ever posted! Love it!!! I love this! 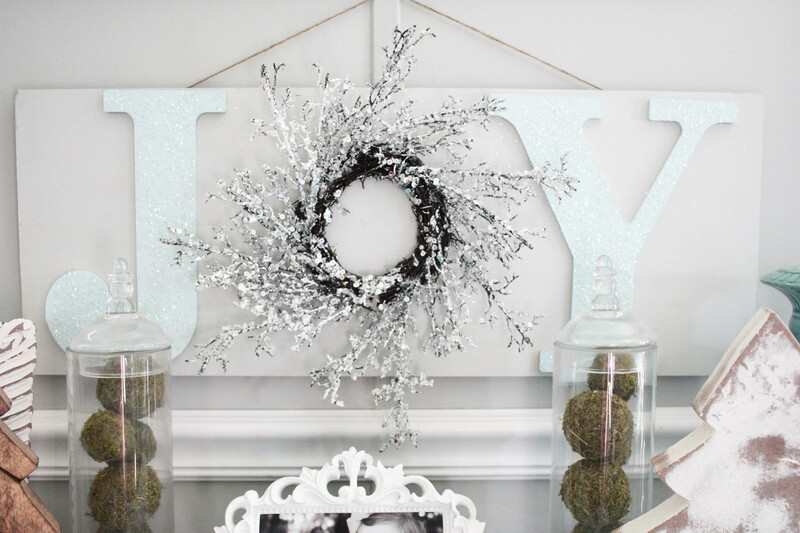 I’ve seen lots of things with a wreath or something else used for the O in joy, but this is my favorite! And I love that you post simple projects anyone can do along with the big furniture builds and room reveals. I hope you will post a full home tour for Christmas! Thank you so much! This is definitely one of my favorites too! I will be doing a home tour of the kitchen/living in late November, along with several other bloggers, so stay posted! My house isn’t up to date anywhere but those 2 areas right now! Haha! This is so pretty! You make it look so easy! Thanks for all your ideas! !